Turkey legs tend to hold in moisture longer than a turkey breast because of the naturally dark meat. 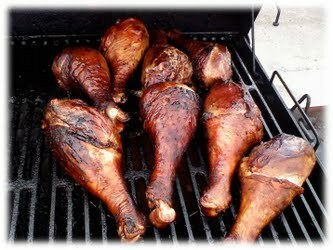 However, we still recommend brining your turkey legs in this smoked turkey legs recipe because turkey is so low in fat. Brining the turkey legs will make sure you have a tender, moist dish that you are proud to serve to your guests. Don't be afraid of the 4-5 hours it takes to smoke these turkey legs because it will give you a flavor you just simply cant recreate in an oven. If you follow the directions in the recipe below, your turkey legs should come off the smoker with a brown, crispy skin with a juicy and smokey flavor on the inside. Start by combining your brine ingredients except for the turkey legs in a large pan on the stove. Bring the ingredients to a boil and stir. Let the brine cool to room temperature before adding your turkey legs and then place the pan in the refrigerator for 4 to 6 hours. You always want to brine with a cool liquid, so adding a few ice cubes to the pan will help make sure the liquid penetrates the turkey legs. Remove your turkey legs from the brine mixture and pat dry. Mix all of your rub seasoning ingredients together and rub the entire outside of the turkey legs to fully coat them with seasoning rub. Place turkey legs into smoker when it reaches 225-240 degrees Fahrenheit. Place your smoker wood chips directly on the charcoal or inside a smoker wood box. Smoke legs for 4-6 hours, until the turkey legs reach an internal temperature of 165 degrees Fahrenheit. The outside crust will be a golden brown color. Make sure you always let your meat rest for 20 minutes after taking it off the smoker before you eat or cut into it or it will lose juices that tenderize the turkey meat. Knowing how long to smoke turkey legs is critical to getting this recipe right. The smoking time will take about 4-5 hours. The easiest way to check your turkey legs for doneness is to use an instant-read meat thermometer in the deepest part of the turkey leg to see if it has reached a temperature of 165 degrees Fahrenheit. See our meat doneness chart for a full list of different meat doneness internal temperatures.